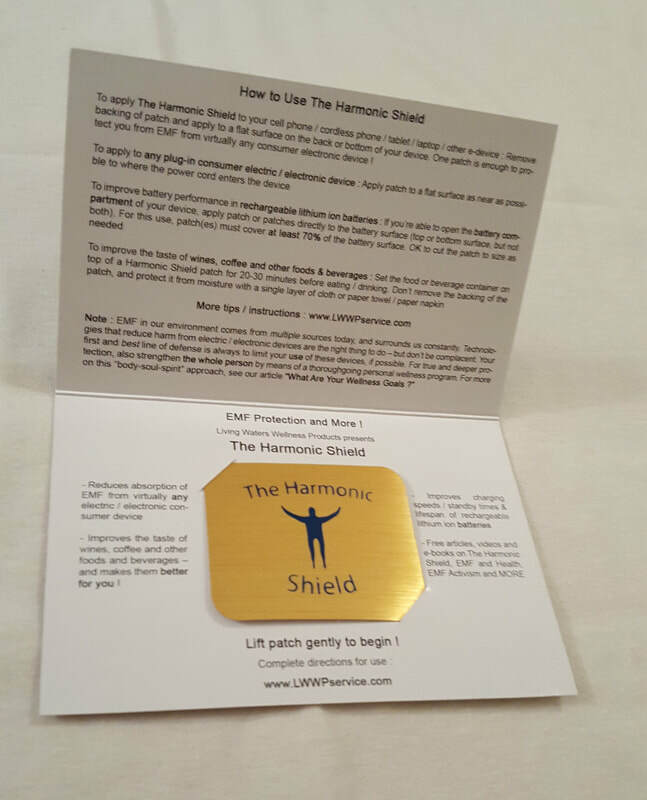 The Harmonic Shield EMF Protection : Product Reviews ! Great reviews for The Harmonic Shield ! Concerning the charger, it's a good strong 2.4 Amps per port, and it looks very nice. When I read the list of things it's been stress tested for on the product service website, my first thought was 'It's way tougher than me !' "
​"We got a new laptop, and I noticed that it ran fairly hot to the touch. There were a couple of especially hot places - particularly in the lower right corner of the keyboard where the heel of my hand rests. I had the sense that if I kept using the laptop, the heat would actually harm my hand. I also got the usual effects I feel around electronic devices when I used the laptop - a woozy, slightly headachy feeling, plus discomfort in my arms and hands. I put the patch on the back of the laptop, where the power cord enters. I also put three more on the back in the areas where the computer ran hottest, and the effect was remarkable. The whole laptop cooled dramatically - and it has never heated up again, even after a couple of hours use. Also, now I can use the laptop for an extended period without the brain fog or the discomfort in my hand and arm"
"I have to work on my computer more than I’d really like to. Once we put the patches on our office devices, I felt a positive change in my energy. I could work longer, with more focus and I felt less tired. It also makes me feel better knowing that my son and husband are protected. We put the patches on our laptops, tablets, phones, router, etc. I highly recommend them for everyone !" 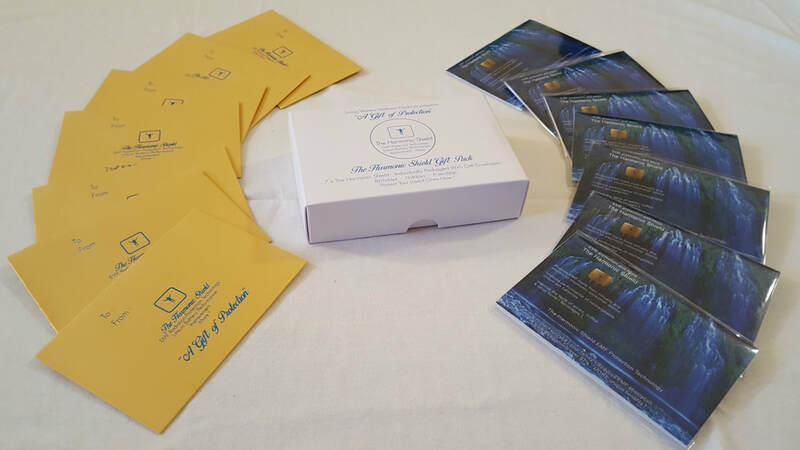 "I highly recommend the Harmonic Shield EMF Protection to everyone. It has changed my life. I did not know that I was greatly affected by EMF exposure, causing me to shake whenever I would view a computer or my phone. I went to numerous doctors but they could not find anything wrong with me. ​One of the doctors recommended me getting the shield. 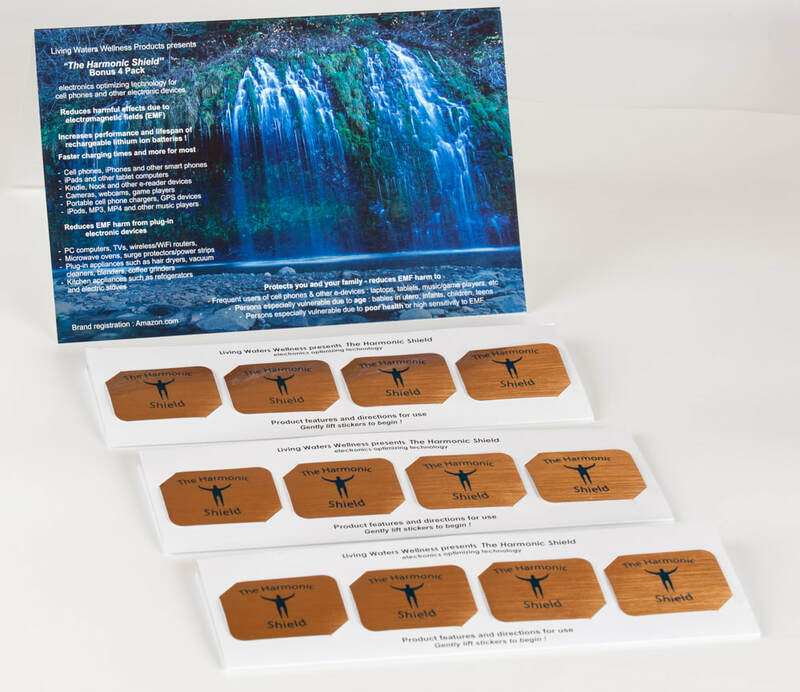 To tell you the truth, I was skeptical but found that once I placed the shield on my electronics, I immediately felt much better...My shaking and chronic shoulder pain went away immediately. I ordered another package immediately and placed the shield in all my children's computers, phones, tablets, TV's, etc... This is a must buy for Everyone." - Terry S The Harmonic Shield featuring The Harmonic Edge "I highly recommend the Harmonic Shields. I placed them on all of our cellphones, our wifi connector and even my surge protectors. Then I sent several to my daughters who live out of state who likewise placed them on their phones, iPads, computers and surge protectors, and, shared same with boyfriends. We all know the affects of EMF, and in the beginning I figured it could not hurt, rather be safe than sorry. As a teacher however, I end up spending a lot of time on computers-doing research and answering parent & school related emails; I have noticed since putting the shields on last year, I seem to have greater stamina on the computers, and do not get as tired as quickly. You might find the same result ! It can't hurt ..... "
Note : The technology of The Harmonic Shield was tested using the same SAR (Specific Absorption Rate) methods shown in this video. The results : with our technology in place, EMF absorption from the cell phone was reduced by over 97% ! "We've put the patch on our tablet computer and our phones, and we feel definite positive effects as far as our energy goes. My husband is also an adventurer - after reading about the negative ions and far-infrared radiation in the patch, he puts one (backing strip still attached) in a silk bag and puts it on places on his body where he feels little discomforts. The best so far was after a chest cold he had. He was getting the effect that any time he took a deep breath, he had to cough. He put the patch on the place it felt like the cough triggered from, and after about 15 minutes, the annoying effect went away. He repeated this several times over the next couple of days (for instance at bed time), and each time it was the same. Then the cough went away on it own. The effects weren't dramatic, but it was definitely noticeable"
​"Our home office is nightmarish in terms of EMF. There are six smart meters just outside our window and down a floor - after they were installed, the office became very unpleasant to work in. We also have a metal frame desk and metal torchiere lamp in the room, conducting (if not amplifying) the EMF. Entering the room it felt like walking into a wall of bad energy. We spend a lot of time on the computer and had effects such as low key headaches, poor sleep and at times even nausea. We put patches 1) on the leg of the desk in the corner nearest the smart meters 2) on the leg of the desk nearest to where we sit 3) on the PC unit and computer monitor 4) on the wireless router in the room and 5) on the multiple plug power strip everything plugs into. The bad effects toned down immediately. The drain on our energy is really much less"
​"I got The Harmonic Shield patches as a gift from a friend at work. My phone battery is a fairly big one so I needed 2 patches. But my batteries charges 60% faster now, and it's holding the charge much better"
​"I have your shield on my phone and immediately noticed a difference .... I used to get a headache after holding my phone for any significant amount of time, and a dull ache in my hands. I no longer have that problem, and my sleep is much deeper after placing the sticker on my battery, as my phone is on my bedside table. I hope to order more soon to place on several other things in my home :) thank you for all you do ! !"